While Samsung's latest flagship smartphone, the Galaxy S4, unsurprisingly took the top spot at three of the four major U.S. carriers' stores in the month of May, Apple's eight-month-old iPhone 5 still remained the most popular smartphone at AT&T retail. The latest carrier retail sales data collected from wireless store surveys by Canaccord Genuity shows that the Samsung Galaxy S4 was the best selling handset at Verizon, Sprint and T-Mobile locations in May. At all three carrier stores, Apple's iPhone 5 came in second place. The figures do not include sales of iPhones from Apple's own retail stores, and only represent direct carrier sales of handsets. In April, when the Galaxy S4 saw limited availability, the iPhone 5 was the top selling smartphone at all four major U.S. carrier stores. 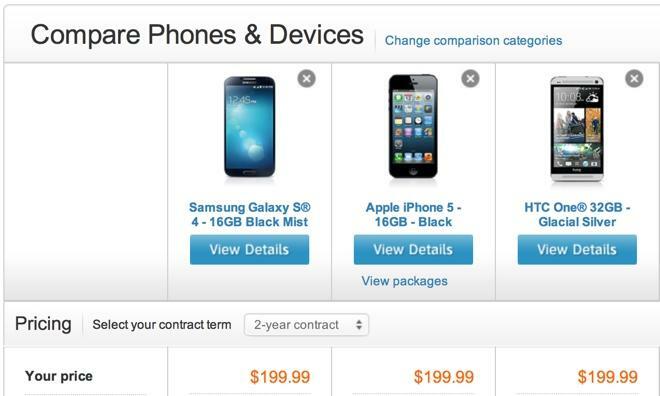 But as shipments of the Galaxy S4 began to increase, Samsung's latest Android handset took over in May  but not at AT&T. For years, the iPhone remained exclusively available on AT&T in the U.S., and customers on that carrier have shown a significant loyalty to Apple. That was evident once again in May, when the iPhone 5 outsold the Galaxy S4. Coming in third in May at AT&T, Sprint and T-Mobile was the HTC One. But Nokia's Lumia 928 found a spot in third place at Verizon, the only carrier where the Finnish handset maker cracked the top three. The popularity of the HTC One and Nokia Lumia 928 pushed out the Galaxy Note II, which had previously been the third-best-selling handset at most U.S. carriers over the last four months. The strength of the Galaxy S4 in May made Samsung the top smartphone vendor in the U.S. for the month, according to Canaccord Genuity. That pushed Apple to second place, while HTC finished in third and Nokia took fourth. Interpreting the survey data, analyst T. Michael Walkley said the Galaxy S4 was helped by Samsung's strong "Galaxy" consumer brand, as well as a major marketing effort from the South Korean company. Walkley noted the iPhone 4 and iPhone 4S, Apple's legacy models, remain in strong demand at major carriers, despite not cracking the top three handsets sold at Verizon, AT&T, Sprint or T-Mobile. Based on the popularity of those previous-generation handsets, Walkley believes Apple will introduce a new lower-priced iPhone model later this year, as recent rumors have suggested the company may do. Finally, Walkley said despite strong reviews for HTC's new flagship One smartphone, he's not sure the company has the "brand, distribution and marketing budget" to compete with Samsung and Apple  the two dominant players in the smartphone market.